Hydradol is a moisturising cream rich in CBD and other natural extracts that hydrate and support normal to dry skin. By employing liposomes, the formula reaches deep into the layers of the skin for maximum effectiveness. Hydradol soothes and hydrates, without using harmful chemicals or additives. Hydradol harnesses the strength and therapeutic diversity of cannabidiol (CBD) and other natural ingredients to thoroughly moisturise the skin. 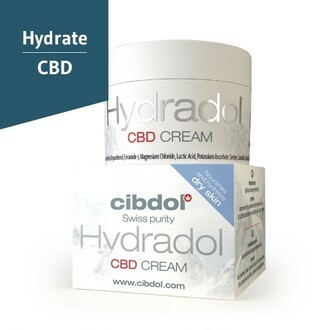 As with other Cibdol products, the CBD in Hydradol is a full plant extract derived from non-psychoactive, organically grown Cannabis sativa plants. Raw plant material is rigorously tested to ensure the absence of chemicals, heavy metals, and other impurities. No only does Hydradol contain CBD, it also includes several other key ingredients that make it an effective, nourishing, and natural source of relief for dry skin. Ingredients such as potassium ascorbate, urea, ceramide, L-arginine, L-serine, and lactic acid provide additional benefits for best results. Potassium ascorbate and urea provide deep and long-lasting moisture to get you on the path to healthier skin. Ceramide, L-arginine, and L-serine provide your skin with the important building blocks it needs to improve and maintain permeability in the skin-water barrier. Hydradol is not just another oil-based moisturiser. The formula makes use of liposomes, which deliver active ingredients to targeted tissues and cells in the body without being compromised by digestive enzymes. This results in a much higher level of bioavailability. Furthermore, liposomes also have a low absorption rate, meaning they facilitate a slower and longer-lasting metabolism of active ingredients. To soothe dry skin, apply Hydradol cream 2x per day. You can use the moisturiser both on your face and other parts of the body. There are no side effects expected when using Hydradol. However, if you experience redness, burning sensation, or rash, discontinue use and consult with your physician. Aqua, Cetearyl Alcohol, Glycerin, Urea, Cannabis, Sativa Seed Oil, Helianthus Annuus Seed Oil, Glyceryl Stearate, Simmondsia Chinensis Seed Oil, Cetyl Palmitate, Macadamia Integrifolia Seed Oil, Butyrospermum Parkii Butter, Panthenol, Stearic Acid, Cetyl Alcohol, Stearyl Alcohol, Ceramide 1, Magnesium Chloride Hexahydrate, Lecithin, Serine, Ascorbic Acid, Sodium Cetearyl Sulfate, Sodium Benzoate, Lactic Acid, Xanthan Gum, Cannabidiol, Glycine Soja Oil, Levulinic Acid, Potassium Ascorbate, Lecithin, Aloe Barbadensis Leaf Juice Powder, Rosmarinus Offcinalis Leaf Oil, Arginine, Sodium Levulinate, Ascorbyl Palmitate, Tocopherol, Beta-Carotene, Daucus Carota Sativa Root Extract, Potassium Sorbate, Limonene, Linalool.